1973 – 1980, 1981 – ? There is no card higher on the send-to-space priority list than Grain Sales. Even if it weren’t a DEFCON suicide card, the fact that it cuts your handsize makes it almost always unplayable. Being hit by Red Scare/Purge while you have this in hand is crippling. This card (and others like Voice of America) is a reason why the USSR tries to hang onto the China Card during the Mid War, so that they can hold multiple cards from turn to turn. SALT Negotiations is a good way to try to defuse Grain Sales — either you raise DEFCON and therefore can play it without triggering suicide, or you get to draw an extra card from the deck and can hold an extra card to next turn. This the best US event in the game. It is certainly by far the best all-around headline for the US: it conducts Operations, it cuts the USSR handsize, it can lead to a DEFCON win, it’s recurring, it’s unplayable by the USSR, and it’s impossible to backfire on you. I almost always try to headline this, even if I have NORAD in play — the only possible exception is if I’m headlining Red Scare/Purge and have Bear Trap in hand. In that case I will save Grain Sales for the next turn headline (but ideally trigger it before Turn 7). Keep in mind that the handsize reduction for the Soviets is just as painful as the Operations you get to conduct; accordingly, I almost always take the card and play it rather than return it. (Also remember that because you’re just playing it like you’re playing any other card, you can do things like send it to space.) Even taking a neutral 1 Ops is often superior to returning the card because of the handsize problems. Scoring cards, assuming that the USSR is unlikely to improve its position, are a good candidate to return so that you can actually conduct Operations. Extremely strong USSR events like Brezhnev Doctrine or Decolonization, IF you can’t or don’t want to space it. For example, if I draw We Will Bury You, I typically just keep it and send it to space, but if I already have a card in my hand I need to space, or if I really need to conduct Operations, then I will return it to the USSR. Harsh US events, like OAS Founded, are sometimes better left as crises for the USSR player (assuming he can’t space it). This entry was posted in Mid War, US Events and tagged grain sales to soviets. Bookmark the permalink. You have a typo in the first paragraph of the USSR section, when it appears that you attempted to start a sentence with “I would rather”, but then begin a new sentence. Curious as to what you were going to say. I’ve never once considered taking the card and just spacing it (meaning I’m not sure that I even knew that I could). It just says “play it”, so there’s nothing saying that you couldn’t just take and send it to space, which would be a terrific way of dealing with having drawn a terrible Soviet event (if you can, as you mention) to prevent it from being triggered, by you or your opponent. I’ve always returned it and conducted a coup with the 2 Ops in those situations. That’s a great play! I’d never thought of doing that either! Great point for when you do draw a truly awful card – WWBY being the ultimate example. Thanks for the great post. I almost exclusively play this game with one person and it turns out that we have been playing this card all wrong the whole time! It was totally by accident – there never was any actual discussion on the matter – but we both apparently assumed that the words “Play it…” meant that you had to play it for the event. So the choice was either take the card and just trigger the event, or return the card and conduct 2 ops. What a difference! We Will Bury You seems like a pretty solid play, assuming Grain Sales was headlined – you don’t get to coup, sure, but you steal 4 ops for yourself and if you set up any kind of interesting crisis on AR7 – broke control somewhere, etc. – you get to go nuts exploiting it while also locking the USSR out of a coup. The VP hit hurts, but you also make it harder for the USSR to get MilOps, so something of a push. As a headline, WWBY is surely one of the best draw as US! I’ve had this happen before – denies the AR1 coup and allows for 4 headline ops – the best kind of ops. Grain Sales is one of the reasons not to advance on the Space Race too fast as the USSR. In the end you will hold too many dangerous cards to solve your problems. On the other hand, being behind on the Space Race track as the USSR creates another DEFCON suicide event (Star Wars). If you use Grain Sales and pull UN Intervention, are you able to play UN Intervention (as an event or as ops)? If you played Grain Sales during an Action Round, you may play the stolen UN for the event or the Ops just like any other card. If you want to play it for the event, simply choose a Soviet card from your hand to play with the UN. On another note, as it has not yet been brought up, I think it’s worth mentioning you can actually use UN Intervention from your hand in order to prevent a stolen Soviet event from happening. It’s probably the situation he have in a game we are playing. Grain sales is headlined and the card pulled is UN Intervention. I said that since UN intervention can’t be played during headline the card has to be returned to owner and US player only gets to play the OPs from Grain sales. I am 100% sure it can be played for ops no matter when you pull it. The card only says it can’t be played as an event during the headline phase. I think that it cannot be played as an event no matter when you draw it, but I might be wrong on this. You might be able to play a Soviet event with it if you use it during the AR, and if you can, you might also be able to do so during the headline phase. Well, actually it just says “May not be played during headline phase”, If you are playing the OPs, you are playing the card, and It “May not be played”, so, why should you be able to play it for OPs? It doesn’t say anything about ONLY the event being unplayable in the headline phase. No, it says “May not be played as an event during the headline phase” on the version I have. The site agrees with me, too. That is completely different then, but it is not what I have seen neither in this page nor in the database of ACTS or the printed version I have. So, which one is the official version? Once that is set the answer will be clear. Can someone answer that question? Maybe should ask in the forums also. I have also checked VASSAL and BGG and all of them have the same text on the card. Charles Martel, could you tell me what version of the game do you have?, yours seems to be the least common… which doesn’t mean it is wrong. I checked the text on the version I have, and it does say this card. However, the site says “this event”. My earlier claim may very well be wrong. What if the Soviets, as their last two cards, have Grrain Sales and a scoring card? Soviets then play grain sales as their last play, forcing the US to draw the scoring card from the Soviet hand and play it, since no event can force you to hold a scoring card. Or is grain sales impossible to play as a last play, if your last card is a scoring card? 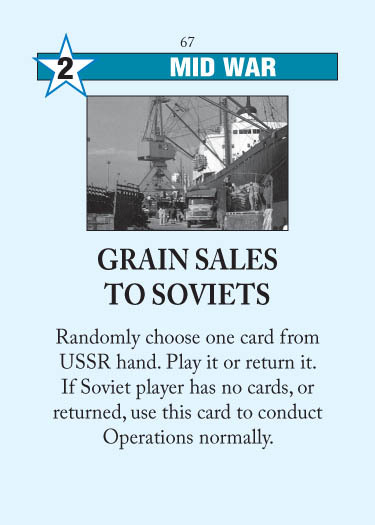 According to the rules, it seems you only check the held card after the turn has ended, which would mean the soviets could force this, get the score card played by the US and get the op points for Grain sales. Right? The US can return the scoring card to the USSR’s hand, and then the USSR is stuck holding a scoring card. The rule that an event can’t force you to hold a scoring card refers to events like Quagmire: if you are supposed to discard to Quagmire, but instead need to play a scoring card, you can play the scoring card. Does that mean the ussr loses the game if that happens? The article assumes that DEFCON is at 2 when Grain Sales is played. If it isn’t, then WWBY is fine to play, but if DEFCON is 2 and you pull WWBY, it’s often better to keep it and send it to space rather than give it back. If the US would play this card, and the Soviet Player would draw a card that lowers defcon. Wouldn’t the US loose the game? I mean according to the rules, the phasing player is the one who is responsible for nuclear war. Isn’t Us the phasing player since it is his turn when he plays the card? I assume you mean that the US draws a card that would lower DEFCON, such as Duck & Cover? In theory yes, but it’s not a problem for the US because even if they choose to keep the card, they can just play the card for Ops instead. The real danger for the Soviets is that the US draws a different card, and now the USSR has Duck & Cover but can’t hold it to next turn. I’m new to TS and Vassal. I’m not sure how to understand this card. In my last game I planned as the USSR to play Grain sales with UN intervention, as I understood, that the US could use the 2 ops (from grain sales) to conduct a coup on my watch and defcon was at 2. Unfortunately I had to discard UN intervention as my opponent played terrorism. I thought I would loose the game unless my opponent was sleeping, but when I played Grain sales as my last card, nothing happened. My opponent couldn’t do anything. Is this correct – as I had no cards left? That’s an error in Vassal. The US player ought to have the option of drawing [nothing] from your hand or just playing Grain Sales itself. If the Soviets have Grain Sales and Olympics left in their hand at DEFCON 2, can they play grain sales, USA plays Olympics, and the US is now the player, so the Soviets can choose not to boycott and no defcon suicide? When the US draws Olympics, it doesn’t have to use it for the event – it can just use it for a battleground coup to drop DEFCON on the Soviets’ turn. Similarly, as the USSR, you don’t need to play Olympics for the event, just the Ops. I am pretty new to TS, and I love the theory page! I am kind of confused on why you say this is the best card for the us and the worst card for the soviets. It doesn’t look like that good of a card. Why is it so bad to cut down on your own handsize? If I was USSR for example, couldn’t I just play it near the end of my turn to mitigate the effects then get dealt a free set of cards next turn? Also, I noticed you said that 5-year plan is a pretty crappy card for the US, but that card also cuts down on the USSR handsize. So what is so different about 5-Year plan and this card? Thanks. The key that makes this card so good is because it allows the US to conduct Ops, and also, because the US has the option to conduct those Ops or choose the event if they prefer. – Why would NORAD be a problem? If you drop DEFCON in headline (as you often want to do with Grain Sales), you no longer get the benefit of NORAD.